It was a Sunday evening in late June 1955, and my brother Mike and I had spent a long day on Nefyn beach. The sea was flat and calm, and we were making good progress towards our favorite ground-fishing (morio) spot about 500 yards out to sea directly from Nefyn Point. We had two sets of oars in the boat. I was rowing in the bow and Mike was rowing near the stern. It was only a small twelve feet long dingy, and with our rowing well synchronized, we were getting out to our destination very quickly. As defined by local landmarks, the coordinates of the spot we were seeking was the peak of Garn Fadryn, a mountain to the southwest along the Lleyn Peninsula, just appearing between the chimneys of La Casina, a cottage located on the cliffs above Nefyn beach. The coordinates marked the spot where there was very good ground fishing, especially in late autumn, when the cod were running. It was around six o'clock in the evening, and there was hardly a cloud in the sky. The sea was like glass. Outside the headland, the reflection of the sun sparkling off the water from Porthdinllaen Bay made it difficult, if not painful, to look in that direction. You just couldn’t shield your eyes from the glare that came in several directions, and we were not smart enough in those days to wear sunglasses. When Garn Fadryn came into view, we had to tack to the east about thirty yards to get our coordinates to line up correctly, before dropping anchor. Then out came the lugworm can, on the hooks went the worms, and down went the lines until the weights hit bottom. No sophisticated fishing rods, reels, or poles, just two plain old hand lines for each of us, one in each hand. Then lie back, relax, and wait for the fish to bite. It had been a gorgeous day. We both had been down on Nefyn beach since early morning, taking care of our father's rowing boats, and hiring them out to English visitors for half-a-crown an hour. The boating season was not fully underway yet since the schools did not close until mid-July, and that’s when large number of English visitors would arrive in the area. Still, there were sufficient people around to make a go of it, and Sunday was a good boating day during the season. It was fairly lucrative work, and it certainly helped supplement the family income. In addition, we both enjoyed doing it. 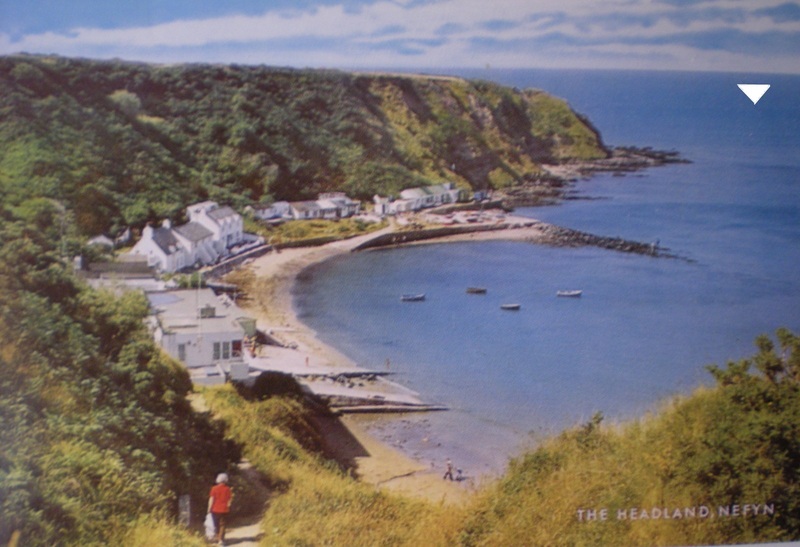 Nefyn was an idyllic little town, and Nefyn beach was just a great place to work during the summer holidays. The tide was fully out around five o'clock in the afternoon, and while Mike was anchoring the boats, I had dug up a can full of lugworms in the sand just beyond the creigiau bach breakwater for bait. And then we were off. We had been fishing for about an hour, catching a few whiting and some small dabs, when we noticed some commotion way out to sea from where we were anchored. There were gulls diving into the sea in the area. There appeared to be a shoal of fish on the surface, and now and then it appeared as if porpoises were surfacing there as well. We didn't think much of it. Porpoises were a very common sight along the Welsh coast in those days, and very noticeable with their distinct black coloring and rolling swimming action especially when the sea was calm. They are called “llanbedyddiol” in Welsh - a very fitting descriptive name to their baptismal swimming style. The commotion at sea seemed to subside after a while, and we took no further notice. I am not sure if the incidents were related, but about fifteen minutes later it appeared. I am not sure who saw it first, Mike or myself. But a huge fin surfaced about 30 yards away on the seaward side of the boat. The fin was at least two and a half feet high, and a blotchy gray color. There was no baptismal, rolling action associated with this fin, it just stayed solidly on the surface. Approximately six feet or so behind it was a smaller tail fin, curled over at the top, and which swayed back and forth in the water. It appeared to be chasing a smaller fish, since there was a disturbance in the water several feet in front of the large fin. And it was coming in our general direction. I just froze. Mike realized very quickly that it was a large basking shark. He had seen one before when he was out mackerel fishing with our father. I remember Mike spluttering out that basking sharks were totally harmless, but that didn’t make either of us feel any more comfortable. We were way out here at sea in a fragile little dingy with the second largest fish in the oceans swimming towards us. The basking shark is second in size only to the whale shark, the world’s largest fish, and they can grow up to 30 feet in length. It was a very scary situation to say the least, and all kinds of scenarios were going through my mind. We scrambled to pull up the anchor and fishing lines as quickly as possible, while getting the oars and rowlocks ready to get out of there quickly if we had to. The shark stayed right on the surface and veered to our left about 15 yards away from the boat. We realized then that it was not chasing a fish. It was swimming with its mouth wide open with the tip of its nose just breaking the surface. The mouth was huge and white in color and clearly visible against the huge dark outline just beneath the surface. There was as much of the shark in front of that main fin as there was behind it. It was much longer than our little boat. We were scared to death, and we clutched the sides of the boat with each hand as if to try and maintain stability as the shark swam by. We kept our cool though. The shark slowly turned towards Porthdinllaen Bay when it got between the boat and the shore, and a short while later it turned seaward again as if to begin circling the boat. Then it ominously disappeared under the surface. That was our cue I guess, and with an open path to shore, we let it rip out of there. And how we did row!! We must have broken all records getting to Nefyn Point. We saw the shark surface again in the same general area, and we were so relieved that it wasn’t following us. We just kept on going, as fast as we could, until we were safely in amongst the moored motorboats in Nefyn Bay. It was an experience we never forgot. Years later, I saw the film “Jaws” in a movie theatre at my wife’s hometown of Guilford, Connecticut in the United States. The scene in the film when Roy Scheider was startled as the great white shark passed close to the boat reminded me vividly of the incident in Nefyn twenty or so years earlier. The shark in our incident though was the great white’s harmless cousin. Yes, Nefyn was an idyllic place, and in many other respects a very exciting place, to grow up in as a child in the 1950’s. For more information on the Basking Shark, please access www.google.com and reference Basking Sharks. For live photographs of similar incidents reference http://www.youtube.com/watch?v=c-fEUaS21ds on a Basking Shark off Cape Cod, or http://www.youtube.com/watch?v=37zllkNqZFo on a more aggressive Basking Shark off the coast of Scotland (apologies for the somewhat colorful Scottish expressions !?!? – turn the volume down if you are sensitive).